As we look forward to some of our jobs that are coming up this fall, the one that excites us the most is Centre College's soccer stadium. We are isntalling a 10 row 99'-4" I-beam bleacher that will have a seating capacity of 504 spectators. We are celebrating another completed job here at Toadvine Enterprises. 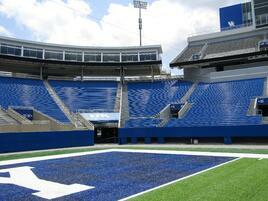 We just finished Southern High School's football stadium bleachers here in Louisville Kentucky. This project consisted of a 15 row bleacher on the home side of the field that spans 232-1/2' with a seating capacity of 1,903. 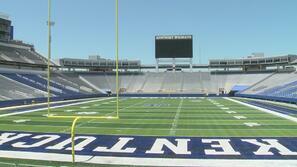 The visitor's side is a 10 row 165' long bank with a seating capacity of 960. The total seating capacity for Southern High School's new bleachers is around 2,863. 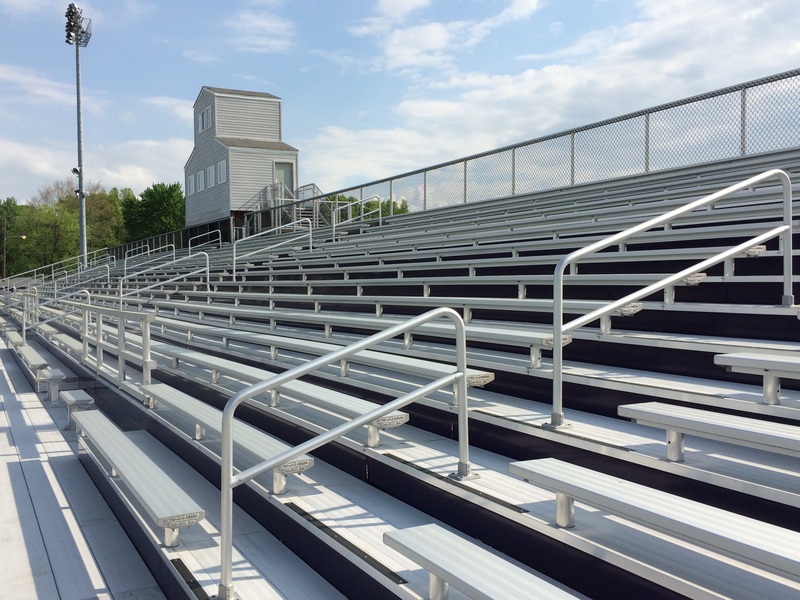 These bleachers also feature Dant Clayton's slip resistant deck boards to increase safety when the bleachers are wet. They also feature purple powder coated riser boards to match the school's colors. Louisville, KY-February 10, 2016- Toadvine Enterprises has joined forces with Dant Clayton Corporation as the exclusive dealer supporting Tennessee. Dant Clayton, located in Louisville, Kentucky, is one of the leading, most innovative outdoor bleacher manufacturers in the United States. Toadvine Enterprises has been selling, installing, and servicing bleachers for elementary and middle schools, high schools and colleges since 1990 and is one of Dant Clayton's oldest and most experienced dealers covering the state of Kentucky. Dant Clayton and Toadvine Enterprises have been working together for over 25 years to provide the very best in spectator seating and are excited to be working together to bring the same great service to the state of Tennessee. The relationship between Toadvine Enterprises and Dant Clayton didn't start with business, the two owners, Mike Toadvine (Toadvine Enterprises) and Bruce Merrick (Dant Clayton) were Sigma Chi fraternity brothers at their alma mater of Western Kentucky University. Mike became a sales representative for Dant Clayton in 1976, then a short time later opened his own company as an independent dealer. 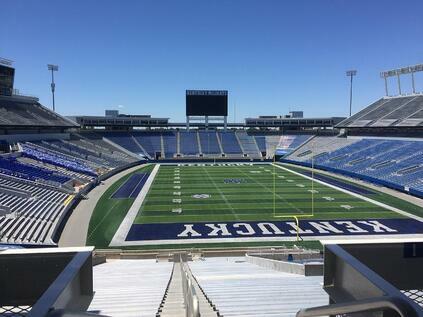 The two companies have formed a great team and Toadvine has become the trusted voice on bleacher seating in Kentucky and is excited for the opportunity of becoming the same trusted resource in Tennessee. "We believe Dant Clayton is the premier seating manufacturer in the industry. Toadvine Enterprises has enjoyed great success in Kentucky with Dant Clayton, and we look forward to continuing that success with Tennessee customers. Our team is committed to providing this same level of excellence for sales, service, and installation in Tennessee," said Mike Toadvine, President of Toadvine Enterprises. A statement to which Chairman of Dant Clayton, Bruce Merrick strongly echoes, "the partnership with Toadvine Enterprises has been a valuable one for both Dant Clayton and customers in Kentucky. The knowledge of the industry this group brings to the table is unparalleled, and we look forward to jointly servicing new clients in this market." Since opening their doors in 1976, Dant Clayton has focused on providing and improving the overall spectator experience by being an industry leader in innovative bleacher and grandstand design. Similarly, Toadvine Enterprises has focused its entire existence on their customer's satisfaction by providing the best bleacher product and the best service possible. It is only natural the two organizations partner once again to serve the state of Tennessee to bring the best outdoor bleacher seating to the Volunteer state. There is no job too big or too small for the Dant Clayton/Toadvine team, whether it is a small 4 row bleacher for a recreational park or high school, or a massive steel I-beam grandstand for a college or pro sports stadium. 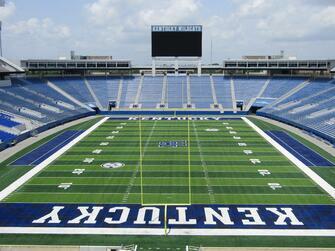 Most recently, Toadvine finished working on the renovation of Commonwealth Stadium at the University of Kentucky. 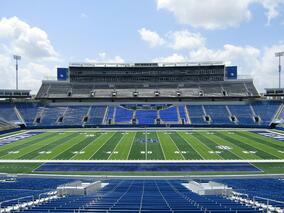 Toadvine added backrests to over 12,000 seats and completed an upgrade to UK's recruiting deck. The two companies have a combined 60+ years of experience in building, selling, installing and maintaining stadium and bleacher seating. If you have any questions or would like more information on outdoor bleacher seating, please feel free to contact Toadvine Enterprises at 877-211-6925 or email at jordan@toadvine.com. We are excited to be hitting the ground running in 2016 here at Toadvine Enterprises. We have several employees who have taken on new roles with additional responsibilities and we even have added a few new team members, including myself. So excitement is in the air around our company as we prepare for a successful 2016 to attain our mission of delivering outstanding value to our customers as a total solutions provider of spectator seating and athletic equipment. In 2016, we are working on further developing our culture at Toadvine Enterprises. As a part of this new initiative, we have started a campaign called "Cheerful Givers." Our "Cheerful Givers" program will be something that we will be focusing on throughout the year to give our employees a chance to extend a helping hand and give back to our community. It is important as a business not to forget your responsibility to help out the community that supports you. Our first Cheerful Givers event took place during the Christmas season. It consisted of each team member receiving $50 from Toadvine at our company Christmas event in early December. Each employee was simply tasked with helping out someone in need during the Christmas holiday. At our 2016 kick-off meeting in January, we had each member of the Toadvine team share their stories of what they did with the $50. As we went around the room, it was rewarding to hear about people's lives that were touched in some small way at least for one day or for one Christmas season. We had several members of the team match the $50 company contribution with money out of their own pockets to purchase presents for children of underprivileged families for Christmas morning. One employee took his daughter to a shelter and let her give the money to a girl of similar age, and he said it turned into a great teaching moment for his daughter. We had another team member buy a $200 Walmart gift card for a family who had their house destroyed in a tornado just before Christmas. We had an employee pay for the groceries of a family that was behind them without saying a word. One of our employees even bought a friend who is suffering from a grim cancer diagnosis a book on the Christian's view of cancer in hopes that it would help him come to some closure with his diagnosis and his relationship with God. So whether we gave to families in need, made a child's Christmas special, surprised an un-expecting mother in line behind us at the grocery store, or tried to help a friend come to closure with the life that they have left on this earth, the initiative was to "act" and make someone's Christmas holiday just a little bit better. Hopefully, we accomplished our mission. Look for more "Cheerful Givers" stories in 2016!